With summer weather, comes summer fun; like swimming, trips to the lake and playground playdates. You are pregnant and feel 20 degrees hotter than everyone around you, but you want your kids to reap all they can from the season. Being pregnant shouldn’t stop you from enjoying those lazy laps in the pool, but it does require a bit more precaution to protect you and your baby. There is the obvious general concern of not wanting to get sunburned. It’s uncomfortable, and many women don’t look well with fire-engine red skin. However, concerns are more than skin deep, and the damage you are witnessing on the outside is only half the problem. When you get a sunburn you can feel that the affected area is hot to the touch. This is because your body has to direct extra blood flow to the area to repair the damaged cells after ultra-violet radiation, according to Scientific America. Extra blood flow to repair injuries, makes it that much harder for your body to give your baby all the increased blood flow they need. The burned skin is in definite need of attention, but your unborn child’s risks stems from the heat required to get the sunburn in the first place. In addition, chances of having a miscarriage or your baby being born with a neural tube defect are increased when you are exposed to extreme heat in early pregnancy, according to Kids Health. Sinking your toes in the soft, warm sand is nice, but never worth your child’s health, or even life. Make those sandy excursions brief, or intermittent, and get the best of both worlds; a relaxing time by the ocean and the peace of mind in knowing that you are doing what is best for your baby. 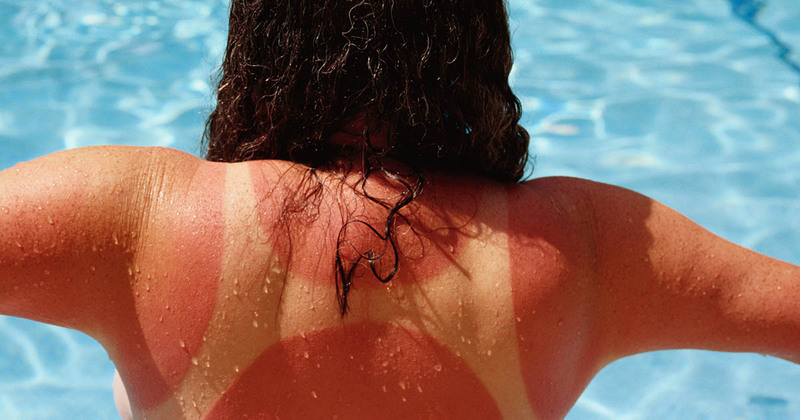 Problems can persist after a pregnant woman gets sunburned. After hindering your body’s ability to regulate your core temperature appropriately, you are at a higher risk for heat stroke, among other complications with your unborn bundle of joy. How hot is too hot? If your body temperature rises above 102 degrees Fahrenheit for any duration past 10 minutes, your baby is at risk, according to Kids Health. A major issue later in pregnancy is dehydration. Oftentimes when pregnant mothers are out in the heat staying busy, they don’t realize how much water they are losing through sweating, and how much strain they are putting on their body. Dangers of dehydration in pregnancy include preterm labor or excessive contractions, according to Romper’s report of RealSelf Contributor and OB-Gyn Carolyn DeLucia, MD. Drinking extra fluid during those hot days is essential. Increased blood in the body means an increased need for an intake of fluids. When you feel your mouth is getting dry, and you are craving a tall glass of water or have a nagging sweet tooth, that means you have already begun the early phases of dehydration. Be prepared when you go out that you have a water bottle that remains cold, and sip on it throughout your outdoor adventures. Always wear sunscreen when in the sun to keep the dangerous rays from harming you and your baby. Go for an SPF of at least 30, and reapply every couple hours to maintain its effectiveness. Read the ingredient label to watch out for oxybenzone, which is linked to low birth weight, according to Fit Pregnancy. You want to choose coverage that offers UVA and UVB protection. Apply not only to exposed skin but to your belly beneath your bathing suit. There have been instances where some have been burned through the thin swimsuit material; after all your pregnant belly is closer to the sun. During the day is the hottest point, so it would be best if you could arrange your schedule to be out in the morning or evening to avoid excessive heat and dehydration. Get fashionably creative outdoors, wearing wide-brimmed hats and lightweight swimsuit covers, or even twirl your own sun umbrella. Consult your OB-GYN anytime you are feeling worried about you or baby’s health after being in the sun, or if you develop a bad sunburn. Taking the right precautions can give you a memorable summer experience, without having to play Dracula indoors all season. Consider if you would bring your newborn out in the weather you want to play in. If you think it is too dangerous or hot for your baby, then it is probably too hot for your little one in utero. Please let us know in the comments section if you have had a sunburn experience while pregnant and how it turned out for you and your baby.